One of the hardest things to do when helping people with difficult life issues is getting them to see how God is working in their life. This is because most people think that God only works through miracles that are noticed by everyone or He is not at work. However, the Bible has many examples of God working in the ordinary. 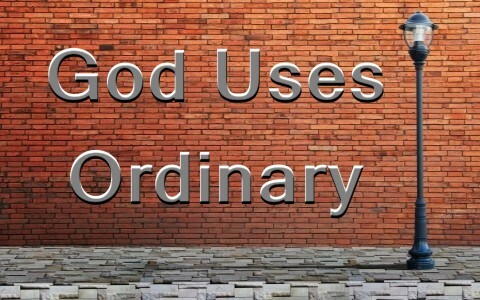 What does God working in the ordinary mean? The first thing to ask, is what is ordinary? The common definition of ordinary is (1): (adjective) “With no special or distinctive features; normal. (Noun) What is commonplace or standard.” By this definition, working in the ordinary would be something that is done that might not be noticed by most people. The root of the word ordinary is the same root that gives us the word order. Something that is ordinary would fit in the routine order of things. God working in the ordinary also means that He works in ways that would not appear out of order from the routine order of our day. Why do people not see God working in the ordinary? Someone may not have the ability to see or understand how God works because they are not saved. When someone is not saved the Holy Spirit of God is not living in them (1 Corinthians 2; Ephesians 1:9-19). Without the Holy Spirit in them, they cannot discern the deep things of God (1 Corinthians 2:10-11). Someone may not see God working in the ordinary because they are spiritually immature because they have not grown in their knowledge of God’s Word (John 8:28-32; 1 Corinthians 3:1-9; Hebrews 5:12-6:3; 1 Peter 2:1-5). Without devoting time to learning God’s Word and other things necessary to grow as a Christian, they are unable to notice how God works in the ordinary things. As we become more spiritually mature, we are given the ability to become fruitful in our knowledge of the things of the Lord (1 Peter 1:2-10). What are two Biblical examples of God working in the ordinary? Nehemiah was a Jewish cup bearer for King Artaxerxes who was the King of Persia. He was part of a group of Jews that was carried away into captivity by the Babylonians. Nehemiah asked a friend what had happened to the other Jews and what was the condition of the city of Jerusalem. What he learned saddened him. He tearfully poured out his heart to God confessing the sins of his people and asking for deliverance. Not long after, while Nehemiah was serving the king, the king noticed Nehemiah’s sadness. Nehemiah was struck with fear when the king inquired about his sadness. However, He immediately prayed to God about the matter (Nehemiah 2:4). From that point on, Nehemiah found the King to be very accommodating in his sympathy and support for Nehemiah. What started out as an ordinary day, ended up with the king providing Nehemiah the permission, the passage, the materials, and the help to return to Jerusalem to rebuild the walls of the city. Through this process, Nehemiah was able to plan the project without interference (Nehemiah 2:12-16), put the right people in places that needed their specific expertise and skills, and maintain his humility as servant by praying for his wayward brethren and himself (Nehemiah 13:29-31). Jacob was the younger twin brother of Esau born to Isaac and Rebekah. Rebekah plotted to have Jacob dress like Esau and pretend to be Esau so that Isaac, who was old and nearly blind, would to give him Esau’s inheritance and blessing (Genesis 25:19-34; Genesis 27:1-28:5). Esau was furious with Jacob so Rebekah told Jacob to go to her brother Laban’s house in Haran until Esau calmed down. In Haran, Jacob met Rachel, a daughter of Laban, and made an agreement with him to work for him seven years so he could marry her. After serving seven years, he asked for Laban for the hand of Rachel. However, Laban tricked Jacob into marrying Leah, Rachel’s older sister. Jacob agreed to serve another seven years for Rachel. Once the time passed, Jacob married Rachel, but soon found she could not conceive a child. In a series of bad decisions, Jacob had 12 sons by four different women including Rachel, who later was able to conceive. This temporary trip to Haran to escape the wrath of Esau resulted in a highly dysfunctional intimate relationship with four different women. What can we learn from seeking God in the ordinary? In the case of Nehemiah, we see a man who was nothing more than a slave who served wine to a king. Yet, because of his great faith, in an ordinary day, God ordained him to be part of an historic event to rebuild of the walls of Jerusalem. The simple declaration by the king to rebuild the walls later served as a historical starting point in the prophecy of the coming Messiah, Jesus Christ (Daniel 9:24-27). We learn that it does not matter who we are, our position in life, or our means, God uses ordinary people in ordinary positions. When our hearts are broken to serve God for the right reasons, He will work in the ordinary. In the case of Jacob, we see a man that used deception to take the blessing of being the firstborn. His action resulted in a divided family. Despite Laban’s deception, Jacob did not totally forsake God. However, despite his poor choices, God still used him to produce 12 sons, who would one day be the patriarchs of the 12 tribes of Israel. We learn that despite our bad choices or circumstance, God will accomplish his will. Finally, we learn that we should seek God’s wisdom and guidance no matter how big or small the matter as we do not know what impact our ordinary life may have on God’s plan to do extraordinary things (Romans 12:12; 1 Corinthians 7:16; 1 Thessalonians 5:17-18). Sadly some of us seek after bigger signs and miracles (1 Corinthians 1:22-23) so intently that we can miss the small voice that speaks great things to our hearts (1 Kings 19:9-18). God works in the ordinary by doing things that most people may not notice because they are not saved or a disciple of God’s Word. Nehemiah and Jacob were just two of many ordinary people in the Bible who God used in His plan for humanity. We learn that in order to see God working in the ordinary, we must seek the small voice of God that makes us aware of how He works in ways that most people never see. An “extraordinary” message Dr Williams!